I recently found out that Grand Central terminal in NYC has so much more to offer than transportation! Earlier this month, Nina and I shared a wonderfully delicious dinner at Cipriani Dolci, located in the heart of Grand Central Terminal, right here in the Big Apple. Cipriani Dolci offers delicious Northern Italian Cuisine with a wonderful view of Grand Central’s bustling main terminal. Yes, you do see the bustle of people running to make their train, but are immediately calmed by the warm bread with butter and some great conversation, while awaiting your delicious food. Nina and I both sipped on the famous Cipriani house drink, refreshing peach Bellinis, and enjoyed appetizers of Mozzarella di Bufala with fresh tomatoes and a warm seared scallops salad. 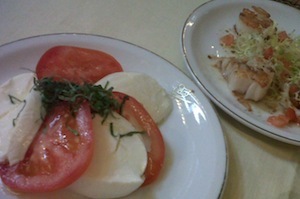 The mozzarella was extremely tender and fresh, paired perfectly with vine ripened tomatoes and fresh basil. The scallops were juicy and sweet, cooked perfectly! 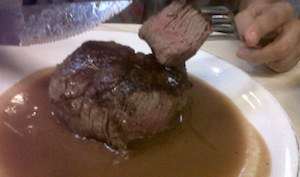 For our main course, Nina and I both ordered the Filet Mignon “Al Barolo”. This was delicious! The meat was very juicy and flavorful and melted in our mouths like butter! Lightly seasoned with salt and pepper, sitting on top of a delicious wine-infused gourmet version of gravy, my opinion is that this meat is best enjoyed medium-rare. Our filet mignon also came with a side order of steamed veggies — asparagus, cauliflower, oven-roasted potatoes! The best part of our evening was served with dessert. Nina ordered the Triple Layer Chocolate cake, which was very rich and dense, full of chocolate and dark chocolate flavors. 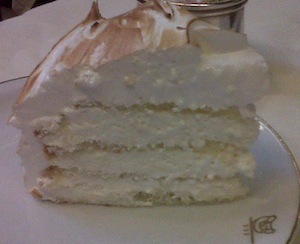 I ordered the Vanilla Creme Meringue cake, which was very light and moist. Each layer infused with sweet cream. A vanilla meringue frosting topped this cake to perfection! Cipriani Dolci is a win win place to go! You’ve got the great atmosphere, absolutely wonderful service, the food is to die for and you can’t beat being in one of New York City’s great landmarks! 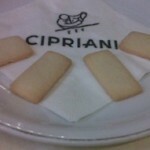 It is recommended to make reservations before heading out to Cipriani Dolci. 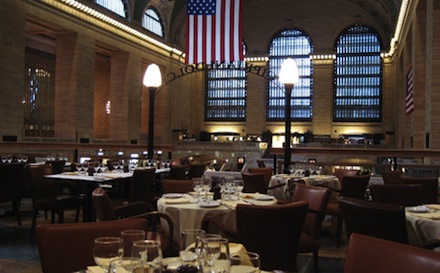 The restaurant is in high demand and with the rush of traffic at Grand Central, you want to make sure you have a seat with a great view. They are currently also offering a special menu for NYC Restaurant Week, which runs until September 5th. This entry was posted on Thursday, August 18th, 2011 at 1:18 pm and is filed under Food, Tasting the World in NYC.